The Official Price is aimed at providing the most accurate reflection of the wagering market in relation to betting on thoroughbred racing. Currently Racing Victoria, Racing NSW, Racing Queensland and Thoroughbred Racing SA have adopted the Official Price with more states to come on board in the near future. Price Increase: the price must be available for at least 40 seconds and must be detected at least 40 seconds prior to the actual start time of a race. Price Decrease: all price decreases instantaneously create an official fluctuation. Race Time: a fluctuation will only be recorded if it is detected at least 40 seconds out from actual race start time. The Official Price is determined for each runner as the best price available with at least six WSPs (Wagering Service Providers). The price collection and dissemination process is fully auditable with price fluctuations collected from each WSP, which are used to determine the Official Price, time stamped and stored in a database. Where is the Official Price displayed? 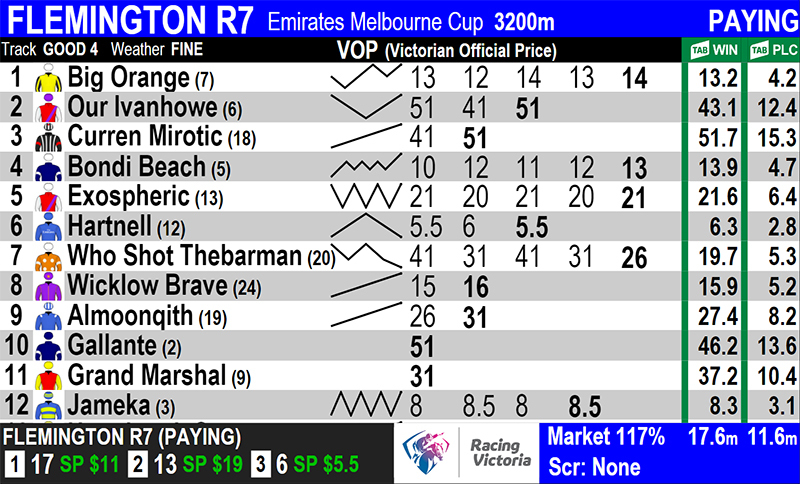 The Official Price is displayed at all race tracks across Victoria, New South Wales, Queensland and South Australia (which hold TAB covered meetings) via LCD Screens. These screens are powered by our Large Format Interface (LFI) controllers. The visual interface has been specifically designed after consultation with both Racing Victoria and Racing Queensland, to suit the needs of punters on-course. How do I access the Official Price? If you wish to gain access to view the Official Price for Personal use you may do so by simply subscribing to the DynamicOdds 'Premium Plus' product. Once you've subscribed, please contact us via the contact details at the bottom of this page to have the Official Price column activated on your DynamicOdds 'Premium Plus' profile. We can offer the Official Price is various types of data feeds for approved entities. If you wish to discuss obtaining access to the Official Price feeds, please contact us via the contact details at the bottom of this page. PLEASE NOTE: Access to the Official Price is subject to approval from both Dynamic IT Group Pty Ltd and the governing authority in each State or Territory.